Hello there! 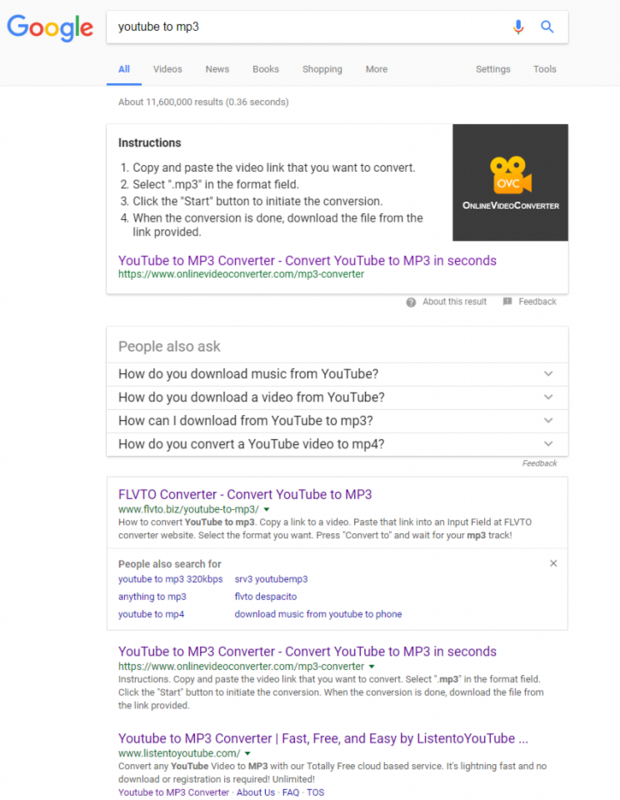 Today I would like to talk about how google perceives “youtube to mp3” search keyword. And what results it presents on such searches. And talk about the meteoric rise of some sites.. Yes, why? Because one of the “major players” aka providers of youtube to mp3 conversion has been taken out of the game (read more: youtube-mp3.org sued and taken down)… It happened in September 2017, just about 1.5 months ago. And look at what has become of the “new order”… So let’s take a look what results google now returns for “youtube to mp3” search keyword. this is called “soaring” and it has happened because technically flvto.biz is now the new resource google deems fit to carry out youtube to mp3 conversion. I have personally gone there to try out the conversion, and it works. Flvto.biz can convert youtube to mp3. so head on over there for that sweet quick youtube mp3 action. the only problem there is the abundance of ads… virtually every click results in a popup ad. sites like this actually is what makes people disable ads, and thus endanger other sites’ earnings, those that do depend on ads… like savetube here. ListenToYoutube.com is the 3rd result now, and check out its traffic go on a tangent!! this one simply got lucky, i guess.. very very very high growth rate and traffic acquisition over the last 2 months… i wonder if they had to get many new server machines..
thanks to the fact that i’ve listed their alexa graph without dates, now you can see a crazy fall, which means one simple thing: original ListenToYoutube is gone!! sad times!! Here are the top 10 results that google now returns for “youtube to mp3” keyword search. also we recommend check out youtubemp3.today for fast 1 click youtube to mp3 conversion.